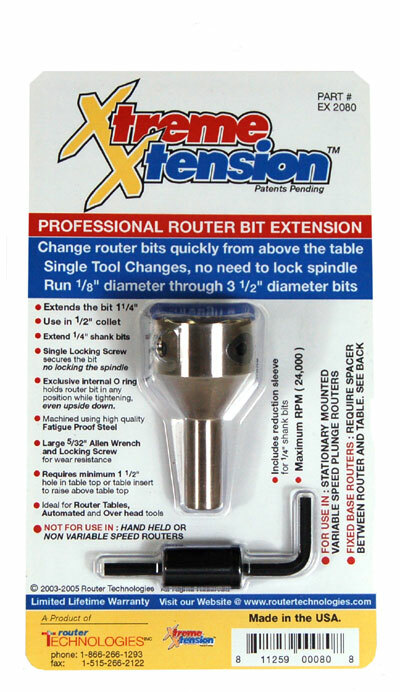 Router Technologies is proud to introduce the Xtreme Xtension. without the cumbersome wrenches and locking of the spindle usually required. The additional 1 1/4" length and 1" deep bore provide complete support of all 1/2" and 1/4" shank bits used with any thickness table or insert plate. The #1 consumer complaint with using a plunge router in the router table, is the inability to raise the collet high enough to easily remove and install cutters. 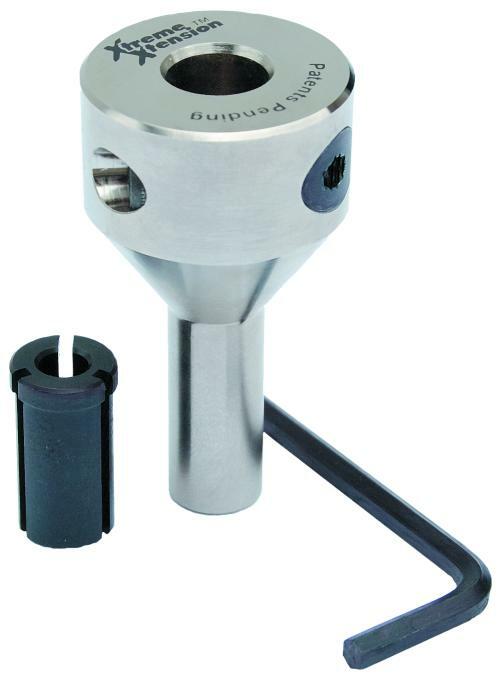 Access to the spindle lock button and collet nut are severely restricted when mounted in a table. 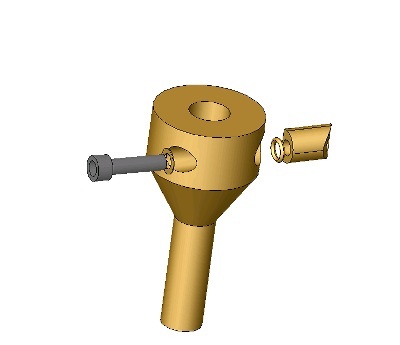 Lack of collet height also limits most 1/4" and some 1/2" shank cutters from being inserted far enough into the collet to work safely and prevent possible shank failure. The only way to extend the reach of these collets is to use an extension. 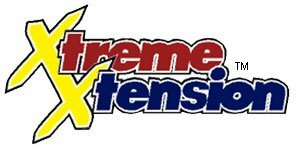 Dynamically balanced and machined from Fatigue Proof Steel, the Xtreme Xtension fits into any 1/2" collet, and extends the cutters reach 1 1/4". The single tool cutter changing eliminates searching for and holding the spindle lock while securing the collet with a wrench. The extensions 1" deep bore provides support for even the shortest shank cutters. Use the included 1/4"x1/2" reduction sleeve to safely support your 1/4" shank cutters. Use this extension with any router table or with any router lift. 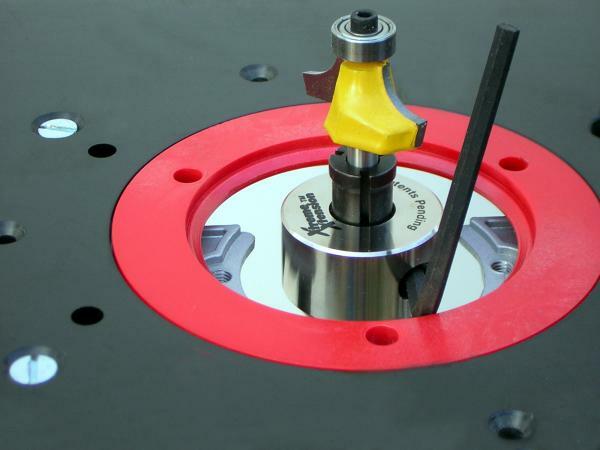 It is ideal for 1/2" through 1" thick insert plates and router table tops. A 1 3/4" hole is required in the insert or table to allow the body of the extension to pass through for above table cutters changes. Installed in the router cutters are quickly changed, using the included 5/32" allen wrench and locking bolt, to tighten or loosen the lock wedge. 1/4 to 1/2 turn of the allen wrench is all that is required to operate the extension. Both the locking bolt and locking wedge are hardened to help provide trouble free service. The extension is for use in table and stationary machine mounted applications only. It is not to be used hand-held or with non-variable speed routers. It also is not to be used with fixed based routers because when extended they do not have a long enough housing to lower or raise the router in the housing and safely retain enough clamping pressure of the housing on the motor body to securely capture the motor. For a preview of the instructions and an explanation of run out and whip please follow these links. possible with any 1/2" variable speed router. Safely run 1/4" shank cutters. reduction sleeve to fully supportthe cutters shank. The wedge and bolt work together to secure retain the cutter in the extension. Properly shaped convex relief will not mar your cutter shanks. Totally repairable should you damage the bolt/wedge. also preview the installation instructions. listed it will come to you individually boxed and labeled.